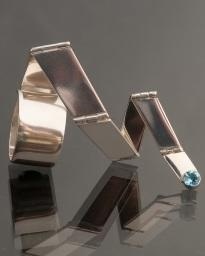 As an artist working with adornment, I am particularly interested in the relationship between object and wearer. In my jewelry I explore the creation of self-awareness and the formation of intimate physical understandings of the body. The rings in the body in motion: play series accentuate the movement of the hand, creating self-awareness through play.